Three whose lives inspire, and are to be celebrated for their grit! "But oh! How transient was the scene - It fled as though it had not been. And all my hopes were vain." 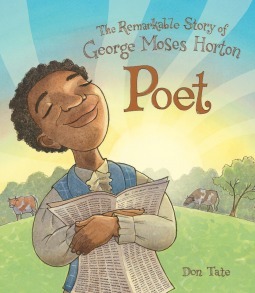 is one of the beautiful lines of poetry written by George Moses Horton and shared in this story of the highlights of his life by Don Tate. The story begins with his early years when he taught himself to read, to his great success selling poems to students at the University of North Carolina at Chapel Hill and finally, his freedom. Although he was still a slave, and had been separated as a youth from his family, words filled his life with hope, even when doing the hard farm work for his master. North Carolinians were more lenient during this time before the Civil War, and George made enough money to later live in town to write, with permission from his owner. He even became so supported that, with some help, he thought he could buy his freedom. Sadly, his master would never agree, hence those poignant lines at the beginning. George didn't become free until he was in his sixties, until after the Civil War. Before and after freedom, however, he published three books. The illustrations are both realistic and poetic, show words flowing from Horton's mind in one beautiful and sad page when he learned he would not gain freedom. The endpapers flow with his words. The story is both a pleasure and heart-breaking to me to think that I've never heard of this poet before, was never taught about this poet in my education. There is further information added in the backmatter. It's a wonderful book to begin teaching about slavery, about those who had no choice about the hard physical labor they were made to do, but then at night, quietly, to learn to read. 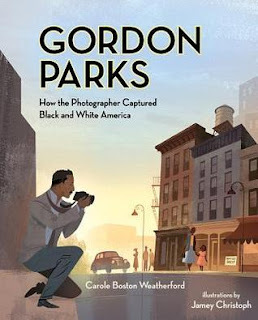 I grew up seeing the photographs of Gordon Parks, and have read his book for young adults, The Learning Tree, but didn't know very much of his background until reading this book. He was born in poverty, but this obviously gifted man saw a magazine feature about migrant workers and bought a used camera. Self taught, his work was soon noticed and began his success taking portrait photos. Later, he took advice given from a boss to find "his" subject, and that became racism after he moved to Washington D.C. and observed the divide between the lives of blacks and whites in our capitol. Later in life he also composed music, wrote books and directed several movies. I enjoyed that the illustrator used darker colors to emphasize the important parts of the content of each page, with lighter colors offering the hint of the background. He also drew photographs by Parks, wonderful to identify some that I recognized, but drawn instead of showing the actual photo. It's an inspiring brief story of this important artist in our history. 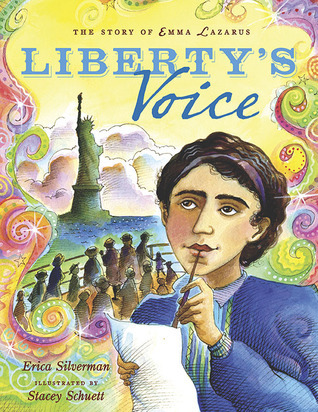 Stacey Schuett colors the story of Emma Lazarus by Erica Silverman beautifully, with poetic whirls around the cartoon-like drawings. The story is filled with so much interesting information leading up to the success that is firmly a part of our history, the poem at the base of the Statue of Liberty. Young writers will love the way she wrote and revised, and used what she observed in her life as subjects. Ralph Waldo Emerson was her mentor! It is good to see how Silverman knits all the details of Emma's life together in order to show how the writing of this most famous poem came to be. These sound like great books. I want to put these books on my wish list. It also gave me an idea to feature some of our library books. Maybe send out to staff a short post on some of our new great books. I enjoyed each one very much, Ruth. Hope you'll find and enjoy them. 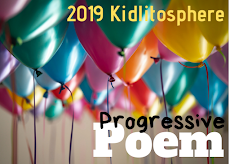 Alyson at Kidlit Frenzy who hosts this meme shares many wonderful ones too, as do all who link up. I have Poet on hold at the library! And I'm excited - I found the book you talked about last week, Grandaddy's ____, I can't remember the title now, but I found it at a different library! 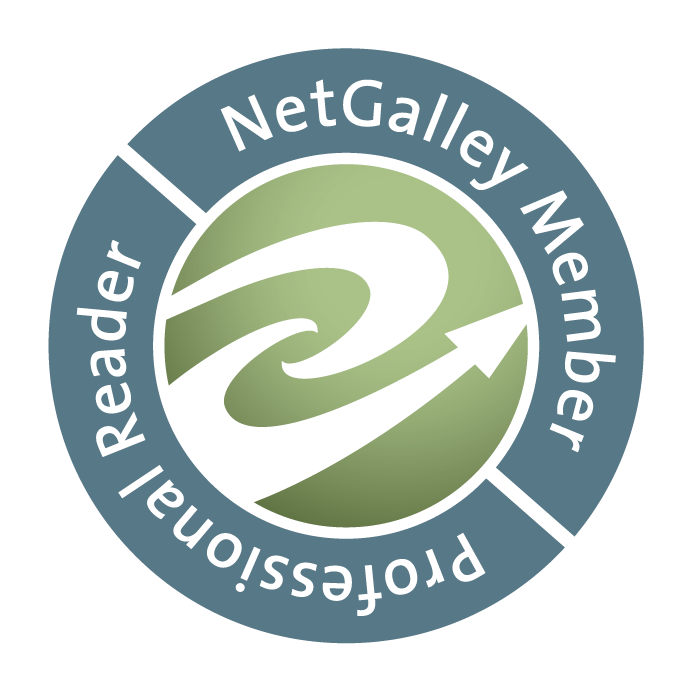 It is so great to have all the titles that we each recommend, isn't it? My collection and my 'check-outs' grow! I am fortunate that my library has so many, and the newest ones too. Thanks, Michele. Happy you found Granddaddy's Turn! That line you shared from Poet was so good. I'll have to check out this nfpb and his work. Thanks, Earl, it is truly an inspiring look at this little known poet. I hope you enjoy it. Beautiful picks this week! I also featured a picture book biography this week - I've been so inspired by thoughtful, beautiful picture book biographies. 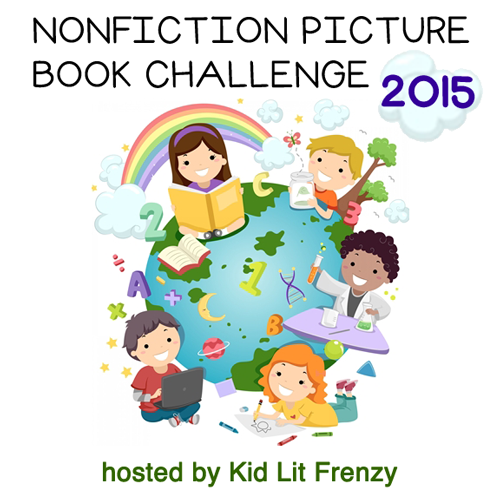 It's an amazing time to be working with children's literature! I think so, too, Jane. I've purchased many, especially like this one about a poet, but a favorite is still The Right Word, about Roget. Thanks! Requesting all three. Can't wait to read the one about Emma Lazarus. We memorized her poem when we were in elementary school. I loved seeing it on a trip to NYC. 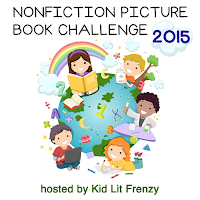 I love sharing NF with my book club, especially since I don't naturally gravitate to this genre. These are wonderful, too, Ramona. It's almost hard to believe that there are so many good ones available. Thanks for reading. You should join in sometime. Your list shared yesterday would be so welcome! Ooo! There is that Gordon Parks book again. I MUST read that one. Thanks, Linda. You're welcome, Teresa. As I said, it included some things I didn't know, would be a great intro to studying his life. So glad that you loved Liberty's Voice. I read it recently and really loved it. Thank you for sharing the others too. You're welcome Kellee. I just read a book about that same time, The Woman In Blue, about the Alcott sister, May, & it was lovely to see that she also was connected to Emerson. Great book, you're right! Picture book biographies are my favorite (bks about nature/animals are a close second). I haven't read any of these, so thank you for putting them on my radar! Terrific, Holly. I hope you enjoy them. There are many good bios available lately, and nature books, too. Wonderful book selections, Linda. I have loved Gordon Parks' work since teaching his novel The Learning Tree when I first started working as an educator. I'm looking forward to reading Carole Boston Weatherford's biography. Thanks, Laura. The book is a pleasure, brief, but gives a lovely overview of this important man in our history.